An intense corrupt cop mystery filled with elaborate story lines, character developments, and intricate connections. Copland is one hell of a movie. First of all, it’s got a cast of actors who are like Scorsese’s young pros reuniting together for one film. Harvey Keitel was Scorsese’s original go to guy until Deniro took over. And then ray Liotta replaced Deniro as the young star with Goodfellas. It was kind of a passing of the torch sort of thing. Keitel was the star of mean streets, then he passed the torch to Deniro in taxi driver (they were both in it), and then Deniro passed the torch to Liotta in Goodfellas (they were both in it). 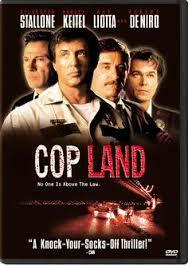 The only one missing from cop land is Joe Pesci. But it’s got plenty of other great cast members to make up for him. Like Cathy Moriarty (from Scorsese’s raging bull), Michael Rappaport, Noah Emmerich, Janeane Garafolo, Peter Berg, Robert Patrick, John Spencer, Annabella Sciorra, the list goes on and on. So the first thing the movie has going for it is it’s off the charts cast. And we haven’t even mentioned Sylvester Stallone, the film’s star. Stallone plays against type here for the first time, playing a slow, fat, dim-witted guy named Freddy. For once he’s not the action hero of the movie or the guy who knows everything, but instead, he’s the poor, pathetic guy who has to sit back and watch the corruption without being able to do a thing about it. The real story here is about a town in New Jersey where cops from Manhattan leave their jobs and live with their families. And the town is filled with corruption. There is a ton of back story here and what it basically boils down to is that the mob bought all these houses, financed them with a mob-owned bank, and gave them to the police men of this one New York city precinct. The man who made the deal for the police officers is ray Donlan (Harvey Keitel). He’s the leader of the bad guys, and boy does he have a lot of guys working under him. The mob made this town for the police so that the police would turn their heads at the mob’s New York City activities. And all of it seems to be working out pretty well for everyone until one day when a main character runs into some unrelated trouble. That character is Murray “super boy” Babbage (Michael Rappaport). He’s driving on the George Washington Bridge, one night, coming home from a Manhattan bachelor party, and suddenly two black guys slam into his car. He thinks they have a gun, and so he fires at them and kills them both. Turns out there were no gun. Murray pretends to jump off the bridge to his death. But really he’s still alive, being kept hidden by ray, and everyone around seems to know it. 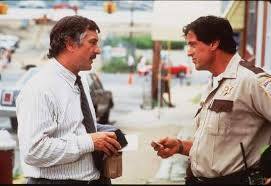 That brings in the internal affairs unit, led by Robert Deniro’s character, Mo Tilden. They work down at city hall and are investigating the entire garrison New Jersey corruption situation. It goes back pretty far, including some back story on the ray Liotta character, Gary Figgis. Apparently Figgis used to be ray’s number two guy (a role now taken over by Robert Patrick), until the day that Gary’s partner got busted by the cops, locked away, and agreed to testify against his new jersey brotherhood. That’s when he got murdered in jail and Gary stopped being so close with ray. Now Gary Figgis sits around getting hammered with Freddy, the only guy in the town who will listen to his rants. But Gary’s got his own storyline, besides all of that back-story. He’s involved in something too, a fire that destroys his house, kills his girlfriend, and May or may not have been arson. You have to watch closely in this movie, because things are setup from the very beginning. There’s so much going on here that it has to be. You have to play detective and follow the clues to really get a hold on everything that’s happening here. There’s also the storyline of peter berg’s character, Joey Randone. He’s married to Liz (Annabella Sciorra), who was the little girl that Freddy saved from drowning when he lost his hearing. That was the event that made Freddy a cripple, and an undesirable; as Liz went on to marry the bad boy Randone. Freddy’s got feelings for Liz, and he even reveals that to her when she asks him why he never got married. And her husband, Joey, is having an affair with ray’s wife, rose (Cathy Moriarty). So, yeah, there’s a hell of a lot of story here, and every bit of it makes sense and is easy to follow, which is kind of amazing when you think about it. The movie is part mystery, part cops and criminals suspense. It’s not really an action film, although it certainly has the ending of one. But it’s more like a cop movie meets a western. There’s the sheriff, the local bar, and the mystery about what the boys in his town are up to. What gives it that tough guy New York City angle is Deniro, playing Mo Tilden to full effect, totally on top of his game. Deniro commands the screen. Just like everyone else in the movie, he’s hoping to use Freddy to get to the jersey guys, and when Freddy comes to visit mo in the big city, we get a very memorable scene that isn’t like anything Freddy anticipated. The actors might be great here, but what really works about the film is the storyline. This is director James Mangold’s first big movie, and he really shows his talent. It’s also his best film to date, with identity coming in as a very distant second. Here, Mangold, (who also wrote the movie) finds the perfect balance of each scene, letting his characters run off some well-crafted dialogue, but also keeping to the point. And everybody’s got ideas. Whether it’s Harvey Keitel giving his “we are the world” speech or Ray Liotta giving Freddy the talk about jagging through red lights, there are a lot of good theories on hand here. Cop Land is so layered and deep that it’s connections between characters is somewhat reminiscent of Shakespeare. Every character has a past and a back-story and also has secrets that they are involved in right now. And all of it revealed carefully, spread out during the course of the film so that the audience can easily make sense of it, without it feeling like too much. Freddy plays the detective role in this movie and director Mangold uses every tool available to him including phone calls, newspaper clippings, and old photo albums. At times it seems like there’s even a little bit of the fugitive in this movie, and that’s not a bad movie to be sharing connections with. Cop Land is a fantastic mystery. Most movies with all-star casts like this end up not being worthy of the actors that are in it. Cop Land is the movie that delivers. There’s a reason why so many big name stars wanted to come to work for this no name director in his first job. It’s because the script was just that good. This is an excellent movie that hits every beat just right.